Dalemain ponies carried hunters up the fell to Martindale, above Ullswater, where red deer were stalked and shot. The ponies carried the shot stag down on the deer saddle while the stalkers came back on foot. Mr R B Charlton wrote in his book "A Lifetime with Ponies" that 32 Linnel bred Fell ponies were being used at a shooting lodge in Ross-shire, in northern Scotland. They were chosen particularly to carry the shooting parties up to the hill. Highland ponies were strong and docile and carried the deer easily and well, but "the real horsemen of the party always select ponies of the Fell breed to ride themselves if they are offered a choice. The Fell pony is more alive and his movements are quicker, he is balanced and therefore the horsemen of the shooting party prefer him as a good ride." 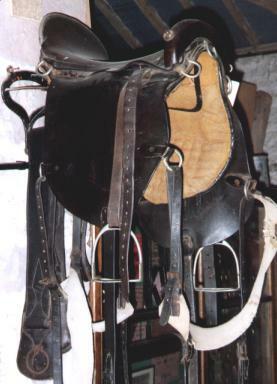 Ponies have also been used to carry grouse in panniers similar to the ones shown in the 17th century page. The saddle is well padded to carry weight - either that of the hunter riding up hill, or the shot stag being carried down. 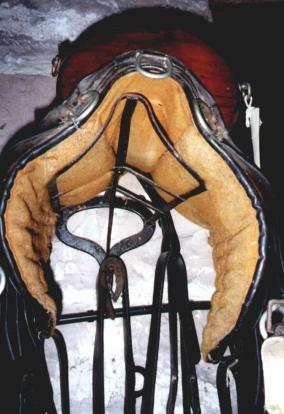 This saddle has a a breast collar and a breeching, like the pack ponies would have worn. There are several large dees to tie coats, guns, etcetera onto the saddle for the uphill ride, and to rope the stag securely on the return journey. Have you ever used one of these saddles? What is it like to ride on? Tell us your story. The Highland pony, right, photographed at the end of a day in Scotland in 1949, has only a breeching to stop the load sliding - maybe the hardy Scottish hunters walked uphill as well as down, so the saddle only carried weight downhill? On at least one estate (above) livelier ponies were supplied for the hunters to ride.